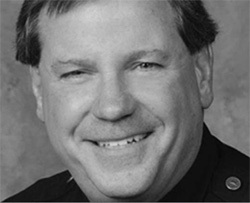 Craig Lally is president of the Los Angeles Police Protective League (LAPPL), a police union that has long engaged in improving their communications efforts with the members, the Department and the citizens. A South San Francisco police officer was in critical condition after a man struck him in the head with a skateboard during a confrontation on Thanksgiving Day, authorities said. The officer was responding to a disturbance in the early afternoon at a business in the 300 block of Grand Avenue, police said. When the officer arrived at the scene, the suspect, identified as 28-year-old Luis Alberto Ramos-Coreas, refused to follow the officer’s commands, authorities said. A Texas state trooper was wounded on the Texas-Mexico border when a bullet apparently strayed from a gun battle on the Mexican side of the Rio Grande. Lt. Johnny Hernandez of the Texas Department of Public Safety says the trooper suffered a leg wound. The state trooper was hit about 1 p.m. Friday while on foot patrol with the Border Patrol agent in Fronton, on the border about 105 miles upstream from Brownsville. Los Angeles city leaders took the first step Wednesday toward a major overhaul of the Police Department’s disciplinary process — a move long sought by the union that represents rank-and-file officers. City Council President Herb Wesson unveiled plans for a May ballot measure that would allow the LAPD’s Board of Rights panels, which review serious misconduct cases, to be made up entirely of civilians. Craig Lally, president of the police union, said Wesson’s proposal would represent the biggest change to the LAPD’s disciplinary process in 50 years. Los Angeles police have long used “less-lethal” launchers with sponge rounds for crowd control and by their elite SWAT team on individuals when less than deadly force may have been needed. But in July, the Los Angeles Police Department equipped patrol officers from several stations, including the Mission Community Police Station in Mission Hills, with these “guns” and their 40 mm sponge rounds, which are intended to incapacitate but not kill a subject, to use on their beats for the first time. Jamie McBride, a director of the Los Angeles Police Protective League, said he’s “all for it,” as long as their use on patrol does not cause officers to put themselves in harm’s way. “If someone is walking to you with a knife and starts to raise it, that’s not the time to use a ‘less lethal’ weapon,” he said. Two LAPD officers have set out on a 12-day long run from Los Angeles to Sacramento, California to raise awareness about police officers who have given their lives in the line of duty, called Project Endure. Officers Joe Cirrito and Kristina Tudor will run a total of 40 miles a day – each will run 20 – in full Class-A uniforms, including their hats and gun belts. The pair will also be raising money for charity: Concerns of Police Survivors (COPS) and the LA Memorial Wall. The Watts Bears, a unique team coached by members of the Los Angeles Police Department, are the new L.A. County Pop Warner Southern Conference Champions. The football team, which consists of players who live in housing projects in Watts, beat the odds and are thankful for their law enforcement coaches. “We don’t really like think of them as police officers. We just think of them as the coaches,” Dominic Conner said. Cops Battle Cops in Court: Wrongdoing by LAPD Top Staff? Six members of the Los Angeles Police Internal Affairs Group are suing the city over “whistleblower retaliation,” alleging they were wrongfully reprimanded in a dispute about unlawful activities and nepotism within the department’s upper levels. The lawsuit says the six believe they were targeted because a deputy chief thought they would speak in support of another internal affairs cop who was vocal about the supposed wrongdoing. A woman was found beaten to death inside a motel room in Harbor City Sunday and police have no suspect at this point, Los Angeles police said. The woman’s body was found about 11:40 a.m. inside the Colony Motel at 1629 Pacific Coast Highway, according to LAPD Officer Irma Mota. The woman appeared to be in her 40s or 50s, Mota said. Her name was withheld pending notification of next of kin. Blunt force trauma appears to be the cause of death, Mota added. Police have no suspect information so far, she said. The homicide investigation was being handled by LAPD’s Harbor Division. Jose Zeron was not a gang member, but the man he was with the morning he was shot and killed is – and police believe the killer killed the wrong person. “He wasn’t perfect but he was the perfect son for me,” said Carmen Zeron of her 37-year-old son they called “Joe.” Carmen said Joe was friends with every person he met and often did charitable things for strangers. Two males and two females were injured a shooting at a Wilmington party early Monday, officials said. The incident was reported about 12:40 a.m. in the 1000 block of North McDonald Avenue, according to the Los Angeles Police Department. Two females and one male were taken to a hospital by ambulance and another male later arrived at the hospital. A helmet-clad robber armed with a handgun got away with more than $10,000 in cash from the Guitar Center in Northridge on Saturday night after tying up the manager with zip ties, police said Sunday. The incident occurred at the store at 19510 Nordhoff Street after closing time sometime between 9 p.m. and 10 p.m., said LAPD Sgt. Brian Eldridge of the Devonshire Community Police Station. The robber, who was wearing a motorcycle helmet the entire time and is believed to be male, met the manager outside, took him inside the store, zip-tied him in his office and then took an unknown amount of money that exceeded $10,000, he said. Residents were forced to evacuate an apartment complex while a man was barricaded inside for hours on Wednesday in North Hills. The standoff began at around 5 p.m. in the 8500 block of Columbus Avenue, according to the Los Angeles Police Department Mission Division. Officers were called in for a possible domestic violence dispute between a man and a woman. A homeless man taking shelter in a residence under construction was forced out with a volley of tear gas and arrested Wednesday after a tense, hours-long standoff with a SWAT team. The incident began about 9:30 a.m. near Beverly and Plymouth boulevards, according to the Los Angeles Police Department. The unidentified suspect was taken into custody shortly before 2 p.m. KNX Newsradio reported that the man was squatting in a home under construction and had threatened workers, but he was not believed to be armed. He was taken into custody after police used tear gas, the radio station reported. No further details were available. Two carjacking suspects picked the wrong victim as their target turned out to be an armed off-duty ICE agent in Wilmington who wounded one of his attackers, police said. The shooting occurred around 7:45 p.m. Wednesday near Figueroa and Anaheim streets, prompting the closure of the Anaheim Street off-ramp from the northbound Harbor (110) Freeway. The agent fired shots at the female driver and her male passenger as they took off in his white Mazda, according to reports from the scene. Both suspects were in police custody, according to a Los Angeles Police Department Harbor Division officer. Family members of a 22-year-old pregnant mother who was stabbed to death in Venice spoke with Eyewitness News Thursday. Jasmine Preciado was a mother to a 3-year-old girl and pregnant with her second child when she was killed in a brutal stabbing at Windward and Pacific avenues. “They killed not only her but a baby, an unborn child. It’s caused us a lot of hurt and we’re all suffering now. Now her daughter’s not going to have a mom anymore,” her aunt, Jackie Bustamante, said. A few weeks ago, Gabriela Futsi’s friends gathered to celebrate her 70th birthday. Her daughter, Isabelle Futsi, told CBS2’s Tina Patel that despite some health issues, her mom had good reason to cheer and to look forward. Now the same friends are looking back at Futsi’s life, cut short by a hit-and-run driver Saturday. As hate crimes surge in California and across the country, Los Angeles law enforcement leaders came together Wednesday to promise they will not let the city fall victim to fear. Los Angeles City Atty. Mike Feuer, LAPD Chief Charlie Beck and Los Angeles County Dist. Atty. Jackie Lacey spoke about the wide-ranging effects that bias crimes can have on the city and county, urging victims of crimes with a racial or religious motive to come forward immediately. Two police officers and two animal rights advocates serendipitously discovered a dying dog on the side of a secluded road in the San Fernando Valley just in time to save its life. The boxer, now named Bronx, was first found laying in pain by off-duty Los Angeles Police Department Officer Rick So on his usual route home. The dog wasn’t moving, and So thought he had been hit by a car due to the way his shoulder joints were protruding because he was so emaciated. Four inmates cut their way through the bars of a second-story window and rappelled down the side of a California jail using a makeshift rope of bedding and clothing before making their way clear of the facility, the Santa Clara County Sheriff’s office said Thursday. Two of the men were recaptured just outside the jail after the Wednesday night escape, but the other two, Rogelio Chavez and Lanon Campbell, remained on the lam early Thursday, Sgt. Rich Glennon said. Crime scene detectives were working to figure out how the men were able to cut through the window’s bars. A deputy patrolling the jail’s perimeter spotted the men as they made their escape. When Leron Morris summoned guards to his cell at a state prison in Lancaster, he showed them a gruesome, bloody scene and a lifeless body. Morris and his cellmate, Rashell Clarke Jr., had a furious fight that ended only after Morris bit off part of the other man’s ear and wrapped a shoelace around his neck, strangling him, according to investigative reports. While other, more pejorative, terms could be used to describe California’s massive legal system these days, let’s just say it’s in disarray, and count the ways. The State Bar, an agency that licenses and oversees hundreds of thousands of California attorneys, has been wracked by financial irregularities and allegations that it has neglected to protect us from unethical or incompetent lawyers. At least eight people were taken to hospitals after an active shooter was reported on the Ohio State University campus Monday, authorities said. One of those eight patients is in critical condition, Columbus Fire spokeswoman Rebecca Diehm said. An 11-year Colorado State Patrol trooper was investigating a crash on Interstate 25 near Castle Rock Friday afternoon when he was hit and killed by a passing vehicle, officials said. Trooper Cody Donahue was out of his vehicle when he was hit by a commercial truck pulling a trailer, said Deputy Chad Teller, a Douglas County Sheriff’s Office spokesman.